AKA Edwin Eugene Aldrin, Jr. Selected as an astronaut in 1963, Aldrin also flew on the Gemini 12 orbital mission where he set an EVA record of 5.5 hours. When he resigned from NASA in 1971, he had cumulatively logged 289 hours and 53 minutes in space, 7 hours and 52 minutes of which were EVA. 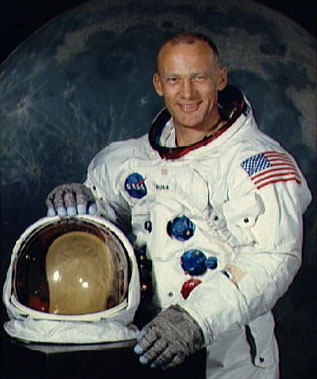 Buzz Aldrin was the second man on the moon during the historic Apollo 11 mission (20 July 1969). Aldrin was preceded onto the lunar surface by crewmate Neil Armstrong, but Aldrin piloted the lunar module and completed a 2-hour and 15 minute lunar EVA on the Moon's Sea of Tranquility. Aldrin continues to promote America's future in space as an author, speaker, and entrepreneur. He has founded a rocket design company, Starcraft Boosters, as well as a non-profit organization, the ShareSpace Foundation, devoted to furthering space tourism for all people. His numerous creative projects include a patented space station design, a unique computer strategy game called "Race into Space", a website, science fiction novels The Return and Encounter With Tiber (co-written with John Barnes), and two other books: Men from Earth and his autobiography, Return to Earth. Aldrin's role in the high-profile Apollo 11 lunar landing has made him an ongoing focus for conspiracy theorists who believe the government staged the Moon landing. In September 2002, Aldrin was publicly confronted by one such person (Bart Sibrel) who cornered the 72 year old Aldrin and a younger female relative, calling Aldrin a "liar" and a "coward". Aldrin punched Sibrel in the jaw. Authorities declined to file charges. In 2003, Aldrin was the unwitting subject of one of the most astonishing Ali G interviews, the highlight of which was his reaction to the question, "What do you respond to all those conspiracy theorist [sic] who claim the moon does not exist?"